Attention Friends: You can win FREE gently used books just by reading this blog! In the coming weeks, we will select a few lucky readers to receive free gently used copies of the books we review on this site. Simply follow our blog and watch for your chance to win. Contest open only to Rochester, MN-area residents. 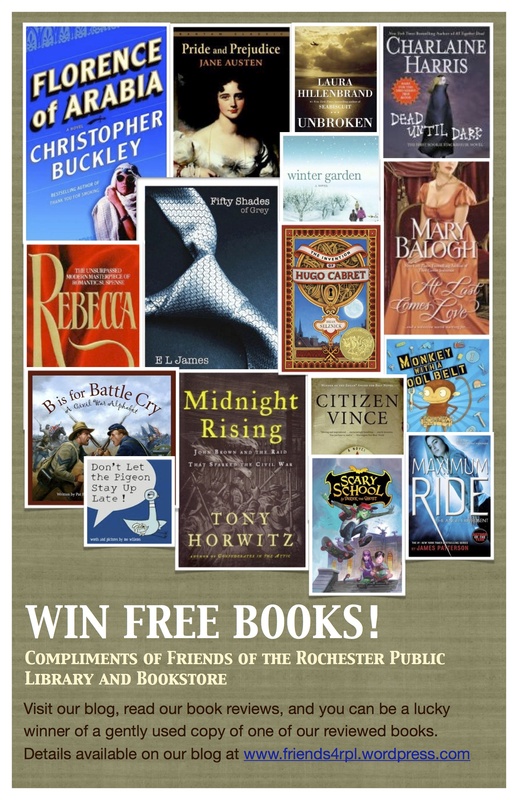 Winners will be selected from a random drawing and must be able to pick up their winning copy at the Friends of the Library Bookstore, located just outside the doors to the Rochester Public Library, during normal bookstore hours. Please note that no copies will be mailed. For now, complete the box to the right of this window to “Subscribe” to our blog so that you don’t miss a single issue and, therefore, miss your chance. Then read our blog and cross your fingers! You could be our next lucky winner! Current Contest Giveaway: Death Comes to Pemberley by P.D. James. Follow this link for the review and contest entry.